Music wise this year was not so fantastic. Yes there were good Music, good singing or good lyrics but only few impresses when they form a complete song. 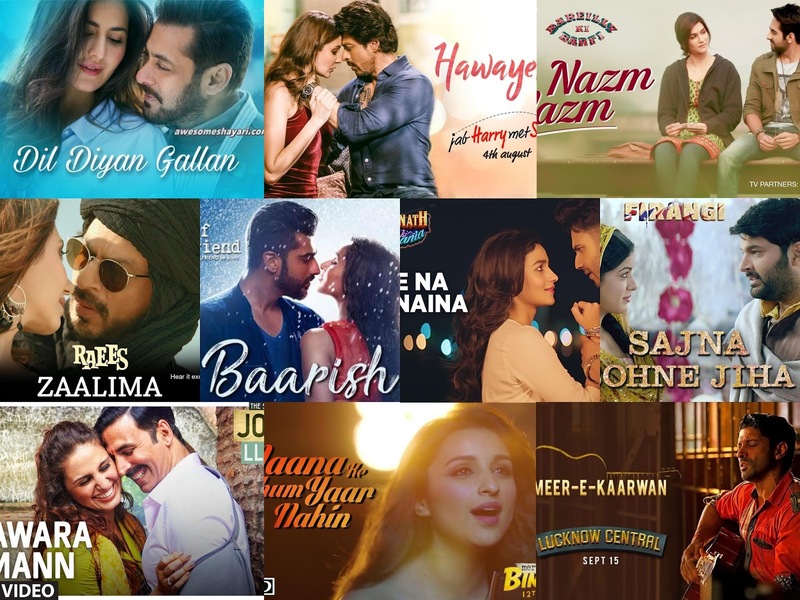 Being a movies and music lover I keep an eye on the things going on in these fields and I found that most film makers are more concerned with foot tapping club songs to attract the youth rather than soulful melodies which become hum-able & evergreen. Here are Top 10 songs of the year 2017 according to me without any order since all are beautiful to me. Feel free to add your choice or criticize my choice. 1. Hawayein (Jab Harry Met Sejal) : It's strange but this year two Arijit Singh & Pritam combination impressed me the most. The film Jab Harry Met Sejal didn't work as excepted at the box office but its songs top the charts thanks to Lyrics of Irshad Kamil and Music of Pritam Chakraborty. Another song 'Jee Ve Soniya' sung by Noora Sisters is also my favorite, I am not including it in the list but sharing it also. Radha, Butterfly, Phurr all songs are nice. 2. Baarish (Half Girlfriend): Sung by Shasha Tripathi & Ash King the song was a hit from the day it released because of the soulful yet modern feeling of the song. It was written by Arafat Mehmood & Tanishk Bagchi. Tanish Bagchi is also the music composer of the song. Another song 'Thodi Der' sung by Shreya Ghoshal, Farhaan Saeed catches listeners attention. Both English & Hindi version of the songs are good. 'Phir Bhi Tumko Chahunga' is also nice. 3. Bawara Mann (Jolly LLB 2): The film which is famous for its story and performances has this one song which I still remember in the end of the year also. Composed by Chirrantan Bhatt, the song was sung by Jubin Nautiyal, Neeti Mohan and is penned by Junaid Wasi. 4. Dil Diyan Gallan (Tiger Zinda Hai): In recent years melodies are rarely featured on Salman Khan but only those showing his swag & style. This one sung by Atif Aslam has lyrics by Irshad Kamil and is composed by Vishal-Shekhar is a perfect composition for Salman to return to this type of songs. The melody released in the last month of the year but has left a great impact on listeners. 5. Mana Ke Hum Yaar Nahin (Meri Pyari Bindu): Parineeti Chopra's singing debut was melodious in this heart touching song. The song is written by Kausar Munir and music is given by Sachin-Jigar. 6. Nazm Nazm (Bareilly Ki Barfi): The film was a surprise hit of the year and no one would have thought such a song will belong to this film. The song is composed, penned and sung by Arko Pravo Mukherjee. The album has also a version sung by actor Ayushman Khurana but that one is unmatched to the one sung by Arko. 7. Zaalima (Raees): Another Arijit Singh song which won my heart this year was Zaalima which came in start of this year. Featured on Shah Rukh Khan this song became an instant hit of the year. The female part is sung by Harshdeep Kaur. The song is composed by J.A.M.8 and penned by Amitabh Bhattacharya. 8. Roke Na Ruke Naina (Badrinath Ki Dulhaniya): Arijit Singh seems to be the singer of this year too with beautiful melodies adding to his name. The song composed by Amaal Malik & penned by Kumaar brings out the emotions of the characters in that moment of the film. Tamma-Tamma remix, Humsafar song are also good. 9. Sajna Sohne Jiha (Firangi): I never thought that Kapil Sharma staring movie song will be featured in this list but this movie surely has great music by Jatinder Shah and Jyoti Nooran's voice compelled me to select this one here. Penned by Dr. Devendra Kaafir the song is understandable even though it has Punjabi lyrics in it. 10. Meer-e-Karwan (Lucknow Central): The known song of a not so known film Lucknow Central staring Farhan Akhtar, Meer-e-Karwan describes emotions of an under trial perfectly. Sung by Amit Mishra & Neeti Mohan, it has Lyrics written by Adheesh Verma and Music composed by Rochak Kohli. Music always remains an important part of our films. It is not wrong to say a good musical film possess better chances to fare well at the box office than a film with bad or unknown music. The year is ending but the Music has long way to go. Expecting good music in Vikram Bhatt's 1921, Rani Mukherjee's Hichki, Baghi 2, Veera Di Wedding, etc but we can't rule out the surprise entrance to this best music list of next year. For next year's best song wait till the next year. Good Bye. An interesting list and love songs from Half Girl Friend, Raees and Jab Harry....of course, Pari made a beautiful debut with Mana Hum with soft voice. I love it. One of my favorite is Rashqe Kamar, numbers from Harry Met Sejal and of course, Swag se Swagat, Ghumar from Padmavati. I need to make a list on my new phone.